Our minds have been been a little scattered lately, preoccupied with doctor visits and such. So while I knew SP's birthday was coming up, I didn't connect the dots and realize until Tuesday that if I was going to bake a cake, I'd be baking in 3 days. I had no idea what kind of cake to bake. So I decided to flip through the cookbooks and recipe clippings. It didn't take long. 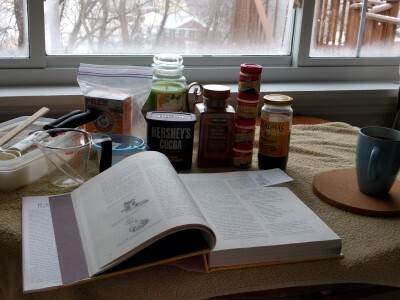 It was in the first book I opened (Baking Illustrated), in the first chapter, the 5th recipe: Gingerbread. SP's loves ginger and spice. We didn't make the triple ginger cookies this past holiday season. 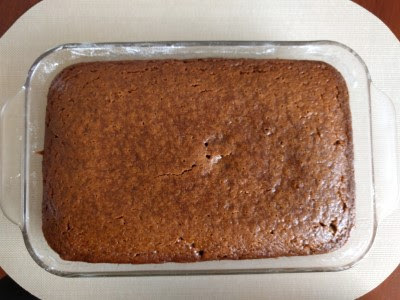 And it made a small-ish cake (11 x 7; can also use 9 x 9 pan) so there wouldn't be tons of cake to eat. We had all the ingredients except for buttermilk, so I called my mom and asked her to come help me bake and to bring some buttermilk. This is a super easy cake. Combine the dry ingredients, combine the wet ingredients + sugar, add the dry to the wet, mix, spread in pan, and bake. There are a lot of dry ingredients (5 spices plus cocoa plus flour, salt, baking soda) plus sugar, molasses, milk, buttermilk, egg, and butter for the wet ingredients. When SP got home from work Friday night, I had a candle lit in the middle of the cake so he got to make a wish and blow it out. He really liked this cake. I kept catching him "sneaking" small pieces! Lots of spice flavor, tender, moist, dense, a little heavy so we ate small pieces of cake. We gave my parents and SP's parents a couple small pieces to try. Both my parents liked it a lot, even my mom who claims to not really like ginger flavored foods. Baking Illustrated liked granulated sugar better than brown sugar in this gingerbread because when they tested it with brown sugar, the spices were overwhelmed by molasses flavor. They added cocoa for a touch of earthiness & complexity. They chose milk over water because the milk fat added tenderness and flavor whereas water made a drier and less rich gingerbread. This is a cake we'll definitely make again. But next time, I'll remember to melt the butter instead of plopping it in with the other wet ingredients and sugar and then wondering why the butter isn't fully mixing in, trying to smush the softened butter with the electric mixer, and ending up with splatter all over my face and sweatshirt from trying to mix in unmelted butter. Oops. Gingerbread recipe here. I baked the cake an extra 8-10 minutes because when I tested it after 40 minutes, the toothpick came out wet.